Colonial Van Lines – a leader among long distance movers in the US – helps consumers save money and gain peace of mind with the use of an innovative virtual visual move estimator app. This household or corporate move estimator/manager app eliminates the perceived need for an in-home estimator and will revolutionize how people handle long distance moves. Colonial Van Lines is The First Long Distance Moving Company With a Virtual Visual Inventory App for iOS and Android Devices. A Company Driven by Customer Satisfaction as Priority. Colonial Van Lines Launched a New Virtual Visual Estimator App for Moving Consumers. In its quest for solutions that make consumer moves easy and hassle free, Colonial Van Lines – a leader among long distance movers in the US – is offers its virtual visual estimator app to consumers in both iOS and Android app stores. This app is a virtual move inventory creator assistant that removes the perceived need for an in-home estimator; who’s function would be to help consumers create an inventory of items to move from their home or office, then provide them with move estimates. 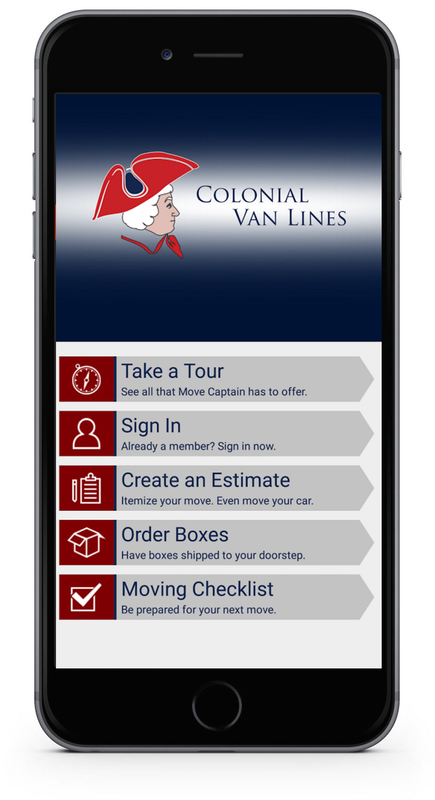 Using the Colonial Van Lines app, consumers will benefit in three aspects: 1) No more waiting for an in-home move estimator. 2) Consumers will save time and money out of state move planing by doing themselves with mobile technology from the app. 2) Accurate quotes will reduce the stress and hassle associated with planning cross country moves. No more waiting for an estimator to come to your home. 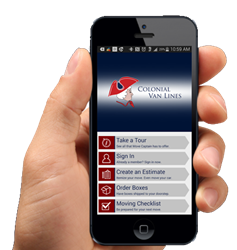 With the Colonial Van Lines' free move estimator app, consumers just grab their mobile device, "create a move", start taking pictures and videos of items to move, submit, and conveniently receive a free move estimate in the palm of their hand, absolutely free of charge. Moving consumers can then follow-up on their move schedule, logistics, and other aspects of their move that they need to monitor. Colonial Van Lines , is a licensed and insured mover with over 20 years of combined experience gathered from the moving and storage industry. The company's hope with this new free app is to expedite consumer’s moves while reducing cost by up to 60 percent off of tariff rates..
Once one submits pictures and videos of items to move, one will be assigned a move coordinator who will be responsible to assist the consumer in providing that accurate quote, visible in their device (phone or tablet). Upon acceptance of the estimate, the customer will be then connected to the verification department where their move date will be secured. From that point, an account Manager will ensure the proper dispatch of truck(s) and driver(s) for the move. In the end, the customer care department will be in contact with the customer to ensure their complete satisfaction with the move process. In this whole process, the app becomes handy as all communication can be handled via it's IM features. Many movers come and go. However, Colonial Van Lines has grown over the years, to become one of the major movers in this country with over 200 local agents throughout the United States. Colonial's contribution to the nation’s legal framework for movers is well known. That’s because of the company's commitment to quality service, training, and accountability that is required from Colonial's local agents. Colonial Van Lines takes pride in providing a service that is worth 5 stars out of 5 from customer surveys and reviews of its agents. 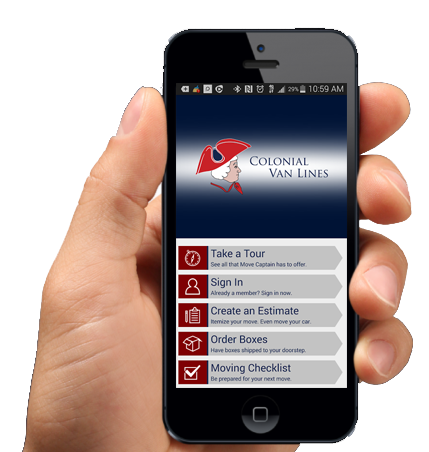 Download the Colonial Van Lines app for iOS and Android devices, and give it a try.